When my children were younger I used to find INSET days a bit of an inconvenience. A day in the middle of the working week when you need to feed and entertain them. At least I work from home, so I guess it’s not too bad, but I don’t know how working mums cope! Nowadays though, it’s completely different. Now my daughter is 14 and when she sees the word INSET day she has only one thought. A day when the theme parks won’t have quite so many queues! 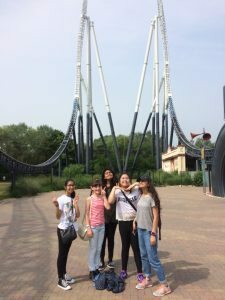 We live close enough to Thorpe Park that she and her friends can get there on their own, (there is a good bus service from Staines station) and I am comfortable with the park’s safety and happy to let them go. 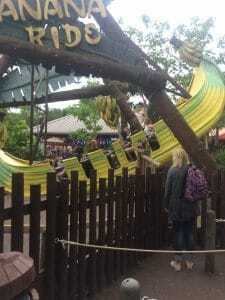 And that means I don’t have to go on all the big rides any more! So, when they got an extra day tacked onto the May half term she and her friends (and half of her school) were off. 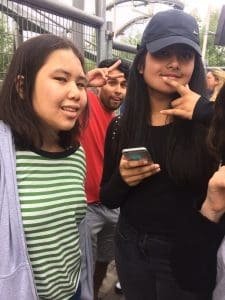 I asked them to document their experience at the park, but what I got was a lot of pictures of them, but not a huge amount of Thorpe Park. When my daughter has an INSET day , Thorpe Park becomes one great big social meet up of her schoolfriends, and as usual they had a blast! 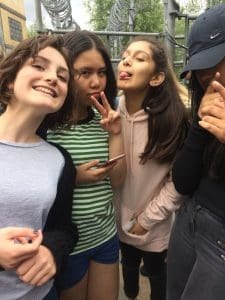 For me as a mum this makes me happy – teens being teens, having fun and doing what they do. As a reviewer it’s a nightmare! I specifically asked them to review the Derren Brown ghost train experience, as this is something that doesn’t interest me at all (in fact the whole concept scares me witless) and I can’t ever see myself going on, but I know it is a popular attraction. They weren’t allowed to take any photos in the attraction, which I guess is fair enough. My daughter’s view was – yes, it is quite scary and once is enough…… It’s quite a similar experience to the London Dungeon and could almost be a separate attraction, she thought. 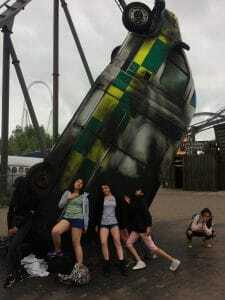 They can’t get enough of the big rides though, particularly Stealth! That’s always the first and the last thing they do…..
I’ve really enjoyed being a Merlin Annual Pass Ambassador this year – all the more so in that my children are getting value out of their annual passes and I can let them go!